Protea Foods Premium Beef Range is made from 100% grass-fed free-range Australian beef and the finest spices and ingredients. We marinate our beef then cure and naturally air-dry it for seven to ten days. This process delivers a delicious air-dried beef product that retains core nutrients such as zinc, iron, magnesium and vitamin B12. No Hormones. No Antibiotics. No GMOs. Protea Foods sources beef from prized cattle raising areas in Australia including King Island, Flinders Island, Gippsland and Tasmania for our Premium Beef Range. Primarily Angus and Hereford breeds are reared in natural and stress-free environments without the use of growth hormones or antibiotics. The result is a high quality, great tasting beef. In developing our Premium Beef Range, we wanted to push the flavour boundaries to where biltong, or any beef snack, has never been before. For over eight months we trialed, sample, and taste-tested various unique flavour combinations in our laboratory kitchen. There were some that didn’t quite make the cut but, more importantly, there were ones that made the grade and we’re proud to bring some of these new flavours to you today. Spanish Paprika draws upon the flavours of Southern Spain. In our travels to the Andalusian region in Spain, we discovered a rich mixture of spices and flavours in foods that had been influenced by the Moors who occupied regions of the Iberian Peninsula for over 400 years. In our Spanish Paprika biltong, we marry the traditional naturally oak-smoked pimentón (peppers) with the aromatic spices from the East. You’ve never tasted biltong like this before. Spicy Sichuan brings together the flavours of Asia to biltong. Ingredients from the Far East aren’t new to South African biltong due to the bustling and lucrative spice trade in the 1600s. Indeed today you find coriander and cloves as two of the key ingredients in many biltong recipes. Our love for spicy Asian food and its interesting spice combinations influenced us to create Spicy Sichuan. We’ve taken Sichuan pepper, with its unique aroma and lemony overtones and blended it together with other premium Asian ingredients, and chilli (for a little bit of heat), to create an amazing taste sensation. We could not create a Premium Beef Range if we did not also include the original and classic biltong flavour. 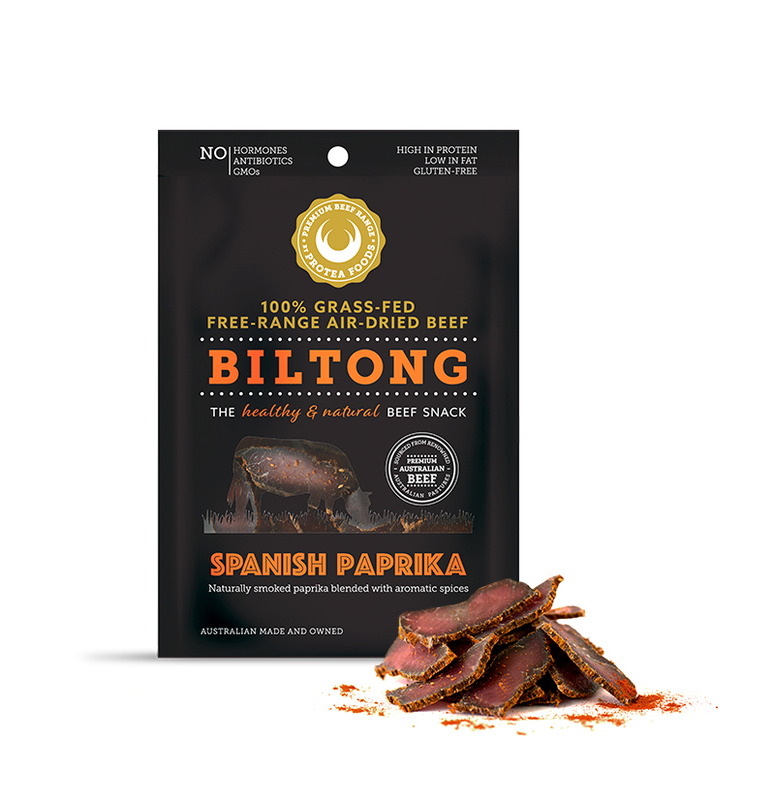 While our Classic flavour may not be ground-breaking as Spanish Paprika and Spicy Sichuan, we’ve still stripped back biltong to its simplest and well-known form. Coriander seeds and cloves feature in the classic mix. We dry roast and grind our coriander seeds in small batches so that we maximise the aroma and flavour. We also add sea salt, cracked black pepper, and vinegar to our Classic spice blend. Our Premium Beef Range uses no artificial flavours or colours to achieve a great tasting biltong product. We use only natural ingredients and ingredients that do not contain any MSG or other glutamates and flavour enhancers like other products on the market. As with all our other biltong products, our Premium Beef Range is high in protein and low in fat. Biltong is an excellent source of natural protein that is great as a post work-out snack, or just as a convenient healthy and natural snack. Available for purchase at David Jones Food Hall (Market St, Bondi, Wollongong, Malvern), independent supermarkets, fine food stores and convenience stores. Coming soon to Metro Petroleum outlets across NSW, Victoria and Queensland.